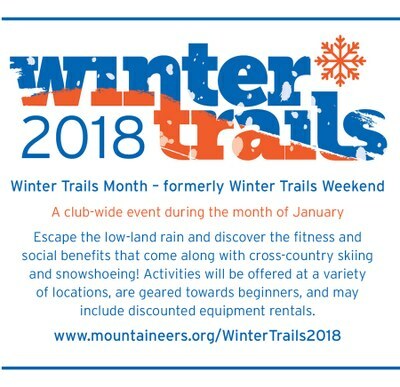 January is Winter Trails Month! Learn more about its origins and how it went from a day to a weekend to a month, starting in the Methow Valley. I became a big-M Mountaineer somewhat late in life. My daughter Fiona and I joined the club when she was only fifteen and I was fifty-seven. We took the Alpine Scrambling Course with the Seattle Branch in 2003 and bracketed the class — she was the youngest and I was the oldest. It came easily to us. I had been doing self-taught solo trips in the mountains for nearly thirty years and involved her from infancy. We returned the following year as instructors for both Scrambling and Navigation and participated in numerous scrambling trips together before she went off to college. My first exposure to snowshoes was on winter scrambles. I was a long-time Alpine and more recent Nordic skier so the transition to another set of strange things on my oversized feet came easily to me. My mentor Johnny Jeans, who was Chair of the Seattle Scramble Committee when Fiona and I joined, pulled me into the Snowshoe Committee. Already a Scramble Leader by then, I began instructing and leading snowshoe trips as well. In the fall of 2014, Chris Ensor sent out a call that he was looking for volunteers to lead snowshoe trips for something called “Winter Trails Day.” I discovered Winter Trails is a national program that offers children and adults new to snow sports the chance to try snowshoeing and cross-country skiing. Chris was the lead person in the Seattle Mountaineers to sponsor a weekend-long event. It would include cross-country skiing and snowshoeing, but Chris was organizing complementary activities as well. And it was to be held in one of my favorite towns: Winthrop, Washington. Winthrop has a special charm that I’ve never found anywhere else. Picture a town in the Old West, complete with covered, boarded sidewalks, and false storefronts on places named Pardners Market, Duck Brand Hotel & Cantina, and Three Fingered Jack’s Saloon. You might even see Kit McLean Cramer, a local wrangler, driving her horse team through town. Someone told me recently that, while passing through Winthrop, she was surprised to discover there were TWO “fake” towns in Washington. While that may apply to Leavenworth, which was the solution contrived by local merchants beset by economic hardship, Winthrop is legitimate. 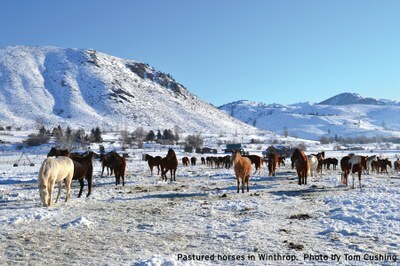 Originally settled by farmers, ranchers, miners and loggers, Winthrop evolved naturally into the town you see today. The mines and logging have faded, with recreation and tourism taking their place, but there are still plenty of farmers and ranchers, with horses a-plenty. Kit McLean Cramer is a fourth-generation local, and has been a wrangler since her teens when she led pack trips into the mountains. She also managed the trail ride concession at Sun Mountain Lodge until recently and is still active in the horse business. Winter Trails Day would provide a good excuse to visit her and her husband Hank, a folksinger friend of mine. Winthrop sits in the middle of the Methow (MET-how) Valley between Mazama and Twisp, and is the primary eastern destination on the scenic North Cascades Highway/US-20. As a result, there’s lot of through-traffic during the summer. However, the road closes in the winter due to snow avalanches thundering down onto the roadway. This made for bleak times for area merchants who had to make the majority of their profit during the summer, or else. In 1977, a handful of valley residents envisioned and inspired cooperation among private landowners and various agencies to form the Methow Valley Family Sports Club. This grew to become the Methow Valley Trails (MVT) of today. The 501(c)(3) nonprofit MVT is now the nation’s largest cross-country ski area, maintaining and grooming more than one hundred-twenty miles of cross-country ski trails in the winter months. The trails have become a central attraction and contributed to both the near-term and long-run economic stability of the valley. Few of the MVT trails in the valley are open to snowshoes though, so when I decided to lead a snowshoe trip for Winter Trails Day, I had to find locations that were (1) available, and (2) easy enough for beginners to manage with some coaching. US-20 closes in the winter about 14 miles west of Mazama, leaving many miles of avalanche-free roadway available for recreation. A check with my mapping program revealed two potential destinations westward of the closure. Cedar Falls was too distant and steep for beginners, but the closed USFS Klipchuck Campground would be perfect. It’s a four-and-a-half hour journey from Puget Sound to Winthrop, half of it on snow-covered roads, so we were uncertain what the 2015 Winter Trails turnout would be. As it turned out, we didn’t need to worry. Both my snowshoe trips filled up, as did Chris’ cross-country listings. It was the first Mountaineers trip for five of my snowshoers. For two, it was the first time they’d put on snowshoes. We did introductions and a gear checks to make sure everyone was dressed properly and carried extra clothing. Next was fitting those with new or rented snowshoes. Initially getting into snowshoes can be one of the most frustrating aspects of the sport. Some models display an octopus-like tangle of binding straps that can confuse engineers. More modern versions resemble downhill ski bindings and are easier to use. Once the snowshoes were securely on everyone’s feet, and after a little instruction on how to walk in them, we were ready to explore the trails. We started out slowly to allow the newbies to adjust and fine-tune fitting their bindings. We also adjusted our pace to make sure everyone was comfortable and no one was overexerting themselves. With people new to snowshoeing, it is especially important to take a break and remind them why they’re there — to look around and enjoy their environment. The Forest Service road we took was mostly untracked, so on Saturday, we practiced some cross-country snowshoe travel. We learned to “build a road” by traveling single file, with the lead person breaking trail, the next stepping where the first didn’t, the next smoothing it out, and so on. Those in the back have it made. Before the lead person tires, she rotates to the back, and the former number two takes over the lead. And so it goes. Along the way, I demonstrated the basics of map and compass navigation. I wanted to show the group it’s not magic and to point out that, with study and practice, you gain the capability go anywhere that your technical capability allows — a true freedom of the hills. We stopped for lunch at the campground, then turned around for the three-plus-mile trip back to the cars. Along the way, we made plans for the evening. Since the Seahawks had a playoff game that night, I suggested dinner at Three Fingered Jack’s with its multiple big screens. Nine of us gathered there to enjoy camaraderie and to cheer the Hawks on to victory. Sunday, we drove up to Sun Mountain Lodge to start the next day’s adventure. 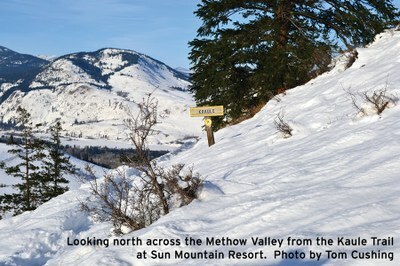 Sun Mountain is a resort on a hill, with cross-country ski and snowshoeing trails that are also maintained by MVT. After parking, we filed into the activities shop to buy our Methow Trails day passes ($5), then headed westward to find Horse Trail. Horse Trail becomes the View Ridge Trail after about 0.6 miles, and it lives up to its name. To the south lies Patterson Lake snuggled between hills, to the west rise craggy peaks of the North Cascades. View Ridge descends to the pioneer Hough Homestead, where one gains an appreciation of what life was like in that place more than a hundred years ago. The return section of the loop ascends the north side of the ridge with sweeping views of the upper Methow Valley from the Kraule Trail. The total loop is only 2.5 miles around, so we were back in time for lunch in the Wolf Creek Bar & Grill and still allowed plenty of time for the 4.5-hour return to Pugetopolis. In 2016, I repeated the same two trips for Winter Trails Weekend, and another leader provided a third snowshoe trip. Each year gets a little better as I listen to the advice of my snowshoe groups and make adjustments for the following year. I hope to see you there! 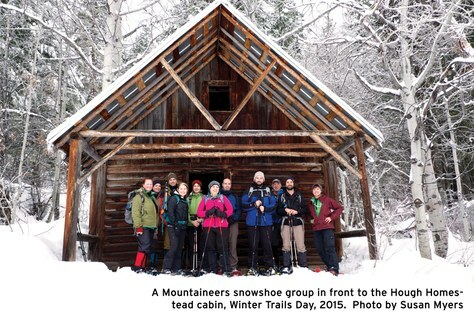 Winter Trails Day is now Winter Trails Month! Learn more about it here.